Last night, Akin Gump, as attorneys for the ad hoc group of second lien note holders of Eastman Kodak, filed the ownership of Eastman Kodak securities for its members under Bankruptcy Rule 2019. I have written about Rule 2019 in the past and I expect a more detailed post coming from one of our guest contributors later in the week. The quick and dirty summary: The new Rule 2019 requires affiliated groups of stakeholders (read: ad hoc groups) to disclose their economic interests in a debtor. The link to the document (Docket #153) can be found here: Eastman Kodak Ad Hoc Holdings. I have also embedded the document below. As expected (I believe this is the first large case that the new Rule 2019 is applicable), the ad hoc members disclosed both their physical and synthetic positions. These disclosures will change with time as members and holdings change but at this point in time, one can get a look at the holders of Eastman Kodak's securities. For detailed on each of the holder's economic interests, see below. 2nd lien notes have rallied dramatically from the lows and received a nice pop on the bankruptcy filing (due to less leakage to subordinated creditors). At some point in the next week, I'll provide an analysis of the EK capital structure, specifically the 2nd liens. On a number of posts in the past, I have tried to discuss how I weigh incentives and motivations of major players in the investment situations I am analyzing. In essence, if you had to boil down a key determinant of how I view incentives, it goes something like this: People want what best for them, and that often means getting paid. Whether that be management teams, board of directors, FAs, shareholders, etc, in the end, and as shallow as it sounds: follow the dollars (specifically the ones that can be earned 100% ethically), and you can more often than not, come out with the solution that inevitable plays out. The example I often point to is that of management team's sizable equity incentive plans granted during the bankruptcy process. More often than not, a management team will have a SCANT equity holding of the debtor prior to entering Chapter 11. Then, out of seemingly thin air, management is granted 4, 6, 8, or 10% of the company via options that generally trigger when the company emerges from bankruptcy or hits some makeshift financial goal negotiated with creditors that are driving the process (read: distressed funds / distressed private equity) and the financial advisers. And because the debtor has the sole right to file its own plan of reorganization, management's incentives are to broker the best deal for themselves financially...i.e. "Well the unsecured creditors are offering us 5% of the equity - if the subs can up that to 10%, we'd be more inclined to support them." Bankruptcy judges are many times loathe to confirm a plan that is not the debtors own creation, it stands to reason that the management team has just scored an amazing pay day for themselves. In my opinion, the annual proxy is the most important, yet the least read of companies' SEC filings. While the entire document is a treasure trove of information (management bio, board bio, shareholder makeup, board makeup, board compensation, etc), the most important nugget of information to me is the report of the compensation committee. This, in no uncertain terms, will tell you what guideposts and targets a board (almost always directed by a consultant hired by the management team) has set up for its executive management team to maximize their financial compensation. Not only that, but it lays out items like acceleration of benefits on a change of control which can lend a clue whether a company is preparing itself to be sold to the highest bidder. Let me take an example. A specialty metals manufacturer recently changed the make-up of their management compensation to eliminate leverage metrics. Historically, the compensation committee targeted a conservative Debt / EBITDA ratio, management hit that ratio (like clockwork), and got paid. Last year, after a few more aggressive board members joined the board, that leverage target was removed from the compensation structure. Since then, the company has added over a full turn of leverage moving spreads out considerably. No credit analyst reported on this. No one even talked about it or mentioned it in an 8k or a transcript. It was subtly removed from the one year's proxy to the next. And if you had caught it, you may have been out of the bonds before their prices fell. In addition, I think board compensation and make up is something that is often overlooked by the analyst community. Let's talk about the economics of being a board member: I'd say the average S&P 500 board member is making between 100k-200k/year for attending 5-8 meetings a year where all their expenses are paid, they are put up in a 5-star, and are wined and dined by management teams that they either have a related business with, or have been friends for a number of years. These board members have the clout of being on a big-name company board of directors. They can brag to their friends about that. People DO NOT give that up easily. If there is a hostile offer for a company and the target's board will be replaced, AND that same board will not make a windfall on acceleration of stock options, then I doubt that hostile will work out. Tender offers can work, but a highly incentivized board of directors will pay a highly incentivized law firm to work out defenses that will keep the pay checks coming. There are other most esoteric incentive structures that analysts need to be cognizant of that are often overlooked. In a bankruptcy for instance, a financial adviser's terms of agreement with the company / equity committee / unsecured committee is often filed publicly with the court. FAs will take a monthly fee but the real dollars come from incentive fees for selling the company. These incentive fees are often structured at various tier levels. Believe me when I tell you that FAs are not setting ultra lofty goals for themselves as to not receive their incentive kickers: They will set reasonable goals that can be used as a base line for valuation work in terms of recoveries to various constituents. In the beginning of January, I wrote up, as a long idea, the AMR 2001-1 As and Bs EETC (as a strip) on the Distressed Debt Investors Club. This past Friday, AMR elected to 1110A the collateral backing that deal sending the bonds soaring today. My thesis rested not only on the large deficiency claim that rejecting these aircraft would bring about, but also on some more qualitative work. Despite the MD-80 status as uneconomic fuel hog, AMR needs a number of these legacy planes to continue operations in certain routes. And as the planes backing the 2001-1 deal were some of the newest MD-80s, it'd stand to reason they'd accept these. But for me, an important intangible: Boeing owned the equity of the planes backing the deal. (AMR was leasing them from Boeing). If you haven't heard, AMR has purchase commitments for nearly $3 billion of Boeing new build planes over the next five years. I think it was in AMR's best interest to keep things running smoothly on the new order side with Boeing and as an act of good faith, accepted this collateral, despite the economics that say rejection was the correct choice for AMR. The leases will probably be re-worked, but in the end, the catalyst, the incentives, and the mis-pricing was there for an fantastic investment opportunity. You lay out what is best for each stakeholder, and then play the game. I've recommended it in the past: Bruce Bueno de Mesquita's The Predictioner's Game is simply the best book on the topic. The book uses game theory in the lens of international politics. I think though it is just as relevant to evaluating whether a merger is going to go through, if a company is going to overspend on capex to meet sales incentive targets, if the unions will play ball in a bankruptcy etc. You will never be able to play out every situation in your head (or an Excel spreadsheet - points to self with two thumbs) with 100% accuracy, but you can improve your ability to gauge how situations will play out and by doing that should vastly improve your investment success. I wanted to give readers a quick reminder about the Global Distressed Debt Investing Summit coming up on February 8th here in New York City. I also wanted to announce that Distressed Debt Investing contributor, Josh Nahas of Wolf Capital Advisors will be speaking on the panel "Current Trends in Distressed Debt Investing." Josh, along with three other panelists, will share their views on the current trends and prospects for the asset class in the coming months and years. We hope to see you there. A few months ago, I asked volunteers for writers for the blog as we expand our coverage of all things distressed. We have three writers that have volunteered - one that will focus on structured finance concepts and two that will focus on legal concepts. In addition, I am looking for two other writers - one to cover European situations and one to cover domestic distressed situations. With that out of the way, I want to introduce George Mesires, partner in the Finance and Restructuring Practice at Ungaretti & Harris LLP, who will be contributing an article once a month for the blog. I asked George a few weeks ago to delve further into the Supreme Court's decision to look at the ability of secured creditors to bid their claims in a bankruptcy auction as it has been topical on a number of case in the past 18 months. Enjoy! On December 12, 2011, about six months after the Seventh Circuit issued its decision in the River Road Hotel bankruptcy case and split from its brethren in the influential Third Circuit (home to the Delaware bankruptcy court) and the Fifth Circuit, the U.S. Supreme Court agreed to hear whether a secured creditor has an absolute right to credit bid its debt under a plan of reorganization whereby a debtor proposes to sell the lender’s collateral free and clear of the lender’s liens. The Supreme Court’s decision, expected near the end of the Supreme Court’s term in June 2012, should provide needed guidance to lenders. Although the Seventh Circuit’s River Road decision provided some comfort to secured lenders (at least to those in Illinois, Indiana, and Wisconsin!) that they may exercise their right to credit bid under an auction sale proposed under a plan of reorganization–– the unsettled state of the law has added uncertainty and risk in these credit bid situations, resulting in a higher cost of capital. Credit bidding is the ability of a secured lender to bid at the sale of the lender’s collateral using the lender’s outstanding loan balance as credit against the purchase price of the collateral. By using the amount of the outstanding claim as currency, the secured lender does not have to come out of pocket with cash, which eliminates the costs – administrative and financing – associated with making a cash bid. Credit bidding protects the secured lender against an attempt by a debtor to sell the collateral too cheaply. If the secured creditor thinks the collateral is worth more than the sale price, the lender may credit bid its debt, and if the lender’s bid prevails, it will have preserved its ability to participate in any appreciation of the value of its collateral in the future. Generally, a debtor in bankruptcy may sell its assets in two ways: (i) under section 363 of the United States Bankruptcy Code the (“Bankruptcy Code”); or (ii) pursuant to a plan of reorganization under section 1123 of the Bankruptcy Code. Under Section 363, it is not disputed that a secured creditor may credit bid its debt (unless the court in very limited circumstances finds that “cause” exists to deny the secured lender the right to do so). Alternatively, a debtor can sell its assets pursuant to a plan of reorganization. In certain circumstances, a debtor can “cramdown” a plan of reorganization over the objection of creditors, including a secured creditor. To cramdown a secured creditor, among other things, the reorganization plan must be “fair and equitable” to the secured creditor. The “fair and equitable” standard may be satisfied by showing that the plan provides: (1) that the holders of such claims retain the liens securing such claims and receive deferred cash payments having a present value equal to the value of their collateral; (2) for the sale of the collateral free and clear of liens (with such lien attaching to the sale proceeds of the sale) but subject to the secured creditor’s right to credit bid; or (3) for the realization of the secured creditor’s claim by some means which provides the secured creditor with the “indubitable equivalent” of its claim. Thus, the plain language of section (2) above states that a secured creditor shall have the right to credit bid in a sale of its collateral pursuant to a plan of reorganization. Indeed, historically, there has been little dispute that a secured lender had the right to credit bid its debt in such cases. Recently, however, several creative debtors (see e.g., debtors in the Pacific Lumber and Philadelphia Newspapers cases) have sold a secured creditor’s collateral pursuant to a plan of reorganization without allowing the creditor to credit bid. And such arrangements have been upheld by two federal circuit courts. In the River Road bankruptcy case, the debtors proposed selling substantially all of their assets, consisting mainly of the InterContinental Hotel Chicago O’Hare, pursuant to a plan of reorganization. As part of its plan, the debtors sought to deny the lenders the ability to credit bid their debt. With its decision, the Seventh Circuit split from the Third Circuit’s decision in 2010 in Philadelphia Newspapers and the Fifth Circuit’s decision in 2009 in Pacific Lumber, setting up a clear dispute among the circuit and bankruptcy courts, which made this issue ripe for consideration by the Supreme Court. The Supreme Court’s ruling will be important for at least two reasons. First, in recent years, most chapter 11 bankruptcy cases have resulted in asset sales – not reorganizations. Thus, resolution of this issue is critically important to the administration of bankruptcy cases and to providing secured lenders clarity as to whether they can credit bid their bid in both 363 and plan sales under the Bankruptcy Code. Continued uncertainty and disagreement among the circuits will lead to disparate results, higher risk, and increased costs of capital. Second, without clarification by the Supreme Court that a secured creditor has an absolute right to credit bid, over 100 years of bankruptcy jurisprudence stands to be undermined. Generally, bankruptcy law has not permitted a secured creditor to lose its lien in bankruptcy without the lender’s consent, payment in full, or surrender of the collateral to the lender. The continued ability by debtors to block secured creditors from credit bidding will shake the lending community’s faith in the bankruptcy system, and be reflected in higher costs of capital at a time when the economy is still on fragile footing. Bankruptcy practitioners are following this case closely. Briefing on the case should be completed by early March 2012, with oral arguments to follow. A decision will likely be issued near the end of the Court’s term in June 2012. We will report on this case as soon as a decision is issued. "The max upside in this case for DIMEQ that would result from being classified as a Class 12 GUC claimant or an equitable lienholder is about $3.00 per LTW (versus today ~ 65 cents) before post-petition interest if the full $337 million reserve goes to the LTW Holders. If the federal judgment rate is applied to that award for 3.5 years it moves the recovery up to about $3.20. On the downside, if DIMEQ is deemed to be Equity and if the Debtor prevails in applying the improper conversion rate then the worst scenario based on Plan value would put the DIMEQ security between $0.07 and $0.10." As those following the case now know, Judge Walrath opined that the litigation tracking warrants were more equity like and the stock collapsed. The risk factors posed by judges ruling against you (in one shape or the other) is ever present in bankruptcy and investors need to use caution when approaching situations with such binary outcomes. For full disclosure, I purchased DIMEQ AFTER the decision was released. I have since sold my position on the settlement which we will get to shortly. Rodney McFadden is back tonight with another post: This one digging into the DIMEQ election form. Buying and selling a security is only part of the equation as it relates distressed debt investing. Many forms and agreements are needed to be filed to insure that a creditor (or in some cases, equity holders) receive what is owed to them. Warning: This is a highly technical post. With that said, I think you'll definitely learn a lot from it. Enjoy! Anyone who has followed the DIMEQ situation within the Washington Mutual Inc., (WMI) Bankruptcy for the last year and a half would probably be willing to concede that the Dime LTW’s are one of the most esoteric securities ever created. Indeed, many millions of dollars were spent by the LTW Plaintiffs and the WMI estate to determine what the Holders of these securities were entitled to. Ultimately the Court determined that these were equity securities that were entitled only to whatever treatment was afforded to other Common Equity Interest Holders. Following the Court’s ruling, there was a subsequent Settlement entered into, by and between the LTW Plaintiffs and WMI, which provided that the LTW Holders would be entitled to receive a $9 million General Unsecured Claim in Class 12 (less up to $3.2 million for the legal expenses of the LTW Plaintiffs); a $10 million “out of the money” Subordinated Claim in Class 18 and 8.77% of the 30% portion of Reorganized WMI going to all Common Equity Interest Holders. The Settlement seems fairly straightforward, right? Well at first blush, perhaps, but a closer look reveals a much more complex situation which primarily results from the trifurcated treatment of the Class 21 LTWs under the Settlement. When looking at the treatment under the Plan, and the Capitalized terms and definitions therein, in combination with the respective Ballots for Class 12 Claims and the Class 22 Interests, a Class 21 Election Form cannot, (and perhaps more precisely) will not be drafted to provide for the fairest or simplest of treatment for the LTW Holders. Before we go forward, and in the interest of clarity, the Class 21 LTW Holders are not entitled to vote under the plan because, despite the settlement, they remain “disputed” thus they receive “Election Forms” not Ballots. A link to a non-executable version of the LTW Election Form is provided below. The version that is currently available, for viewing only, urges Holders to “PLEASE CONTACT YOUR NOMINEE TO RECEIVE A VALID ELECTION FORM” which has me wondering if they ever intend to distribute executable versions, absent an overt request. The LTWs have always been the red headed stepchild of this Bankruptcy Estate, so I guess there’s no point in stopping that now. Pro Rata share of a Class 18 Subordinated Claim, up to $10 million, which is currently viewed to be out of the money. None of the Newco Stock going to Common Equity Interest Holders (if any). My understanding is that there either cannot or will not be any Newco Stock escrowed for the Common Equity Interest Holders. The recovery on account of the Class 12 Claim and Class 18 Claim if you turn in your paperwork within 12 months following the Effective Date. So, given the above, exactly what are the risks, going forward, for an LTW Holder and what is the potential value of these LTWs? According to the liquidation analysis within the Disclosure Statement accompanying the 7th Amended Plan of Reorganization for WMI, the value attributable to “Equity Interests” is approximately $145 million. This amount is comprised of the $70 million value of Reorganized Common Stock as valued under the Plan plus the $75 million cash “Release Consideration” paid over from the Senior Noteholders. At a $145 million Plan value for all Equity Interests collectively, the theoretical value in the hands of LTW Holders, assuming nothing changes, would be calculated as (0.0877*.30*145,000,000/113,000,000) which yields a value of $0.034 per LTW on account of the Newco portion of the LTW Settlement. The $9 million Class 12 GUC claim, less up to $3.2 million in fees paid to LTW counsel, would yield a value of $0.051 per LTW on account of the allowed General Unsecured Claim portion of the LTW Settlement. The total theoretical value for DIMEQ would seem to be $0.085 per each LTW based on Plan value. And realize that this is discounting entirely the Class 18 claim of $10 million for now because it is “out of the money”. It also assumes that an LTW Holder tenders the releases so as to be received by February 29, 2012 and that the Common Equity Interests actually receive a recovery under the Plan. However, the discussion doesn’t end there because there apparently is some risk that the Court will apply the Absolute Priority Rule (APR) and rule that Common Equity Interest Holders (Class 22 – WAMUQ & PFG Claimants and Class 21 - DIMEQ) can’t be paid until the Preferred Holders in Class 19 are paid in full and that would present a $7.5 Billion hurdle based on Par value. The TPS Group, representing the Cayman REIT Preferred Holders, has been lobbying for the application of the APR, and they are not alone. Near the end of the hearing on Wednesday, January 11, 2012, the Judge even opined that the Debtors’ assumption that it could violate the APR was “Optimistic”, which signals that she is giving some consideration to instituting the APR. Absent that, the Court has the discretion, and the blessing of the Debtors and the Equity Committee, to adjust the proposed distribution of 30% of Newco to Common Equity Interest Holders. The institution of the APR or any downward adjustment of the Newco allocation by the Court would necessarily mean that the currently proposed recovery for all Common Equity Interests would be decreased if not entirely eviscerated. Accordingly, there is risk that the Newco portion of the recent LTW Settlement may have no value in the hands of the LTW Holders. So it begs the question, if the APR is instituted, why would the Preferred classes receive all of the Newco when senior classes of subordinated claims in Class 18 are projected to receive no recovery under the plan? The answer there would seem to be that, since the Court bestowed upon the Equity Committee the opportunity to pursue “Colorable Claims” for the purported insider trading of certain Settlement Noteholders, the EC would obviously not agree to give up the opportunity to pursue those claims (via the current settlement embodied within the Plan) if none of their constituency would receive any benefit. So my guess is that if the Absolute Priority Rule is applied, and that is still a big if, it would only be imposed amongst the equity classes. It remains to be seen what will happen there but it bears noting that, according to the Ballot Instructions, votes for the Common Equity Interest Holders (except for DIMEQ) and the Preferred Holders in Class 19 would have to be submitted and received no later than February 9th for the votes to count and the Releases would have to be tendered by February 29th in order for the equity classes to be eligible to receive a recovery under the Plan. The big downside is that by the time that the Releases are provided, Equity Interest Holders won’t know what the final treatment will be. The resultant problem here for LTW Holders is that they also have until February 29th to tender their securities and give the Releases. In reality, to be safe, one would need to turn in the paperwork a few days in advance of the deadline to be certain it is timely received. Once again, based on a reading of the Class 21 Election Form, it would appear that if the Releases and the LTW securities are not tendered by the deadline, one would not be eligible to receive any Newco but could apparently still get the recovery on account of the allowed Class 12 Claim and the recovery from the Class 18 Claim (if any) if the Releases are provided within 12 months after confirmation. However, it appears that you have to request a special form from the Liquidation Trustee in order to affirmatively provide the releases on a post-confirmation basis if you miss the Feb. 29th deadline. Since the Confirmation hearing is on February 29th you have to tender the LTWs and releases before you know whether the APR will be applied so you are just flying blind at that point and can do nothing about it. Accordingly, heading into the February 29th Confirmation Hearing, the only guaranteed recovery for LTW Holders would be the Allowed Class 12 Claim of $9 million, less up to $3.2 million in legal fees for LTW Plaintiff Counsel, shared amongst approximately 113 million LTWs. One final item that LTW Holders should be aware of is that once the Election Forms are turned in, if the Holder makes the choice to provide the requisite Releases in order to accept the treatment under the Plan, the securities themselves will also be tendered. As such, the LTWs would no longer be tradeable and likely a contra cusip would be issued within the Holder’s account to freeze the securities. For reference, Banc of America had a 39-41 quote on the Buffets TL this afternoon, with a few other dealers making markets slightly wider than that (GS was 37.5-42.5 earlier today). In the press release announcing the restructuring agreement, the Company noted that existing lenders would be providing a $50M DIP loan and that 81 under-performing restaurants would be closed during the restructuring process. The plan contemplates that the entire $245M of outstanding debt will be eliminated and that existing lenders will receive 100% of common stock upon emergence (subject to dilution of the Management Incentive Plan at 8%). Buffets, Inc.'s legal advisors are Paul, Weiss, Rifkind, Wharton & Garrison LLP and Young, Conaway, Stargatt & Taylor, LLP. The Company's financial advisor is Moelis, Inc. In his Declaration of Support for the Chapter 11 petition and first-day motions, A. Keith Wall, the company's EVP and CFO noted that this would be the second filing of the company in 5 years as the company filed in January 2008 after the disastrous acquisition of Ryan's Restaurant Group confounded by a weak economy. At that time the company was in bankruptcy for 16 months, with a confirmation in April 2009. "Now, however, many of the former unitary leases have been broken up by means of numerous property sales to individual landlords. Consequently, the Debtors believe the legal impediments that restrained the Debtors' ability to reject such above-market leases in their prior chapter 11 cases have been eliminated, and the Debtors intend to file a motion to reject many such leases"
In the Motion to Approve Use of Cash Collateral (Docket #18), terms of the DIP Credit Agreement are laid out: $20M synthetic LC facility with a $29M DIP term loan. This is split up into three tranches: A/B/C with sizes of $30, $10, and $10M respectively. The TLA and TLB tranches will pay L+900 with a 1.5% floor with the TLC paying 250 basis points more than that. We do not know what the OID (upfronts) or backstop fees will be as the Company has requested an order to file fees under seal. No projections were filed with the disclosure statement so its hard to get a sense for what sort of value the term loan offers at 40 cents on the dollar. 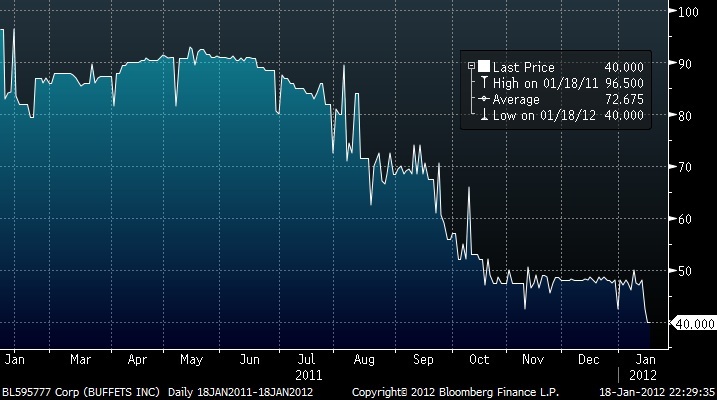 The DIP is interesting but that's probably already spoken for by one of the aforementioned lenders. We will continue to monitor the situation as more information is released. Today, Zerohedge posted Greenlight's 2011 4Q letter which I've embedded below. For those wanting the juicy details, Greenlight's 5 largest long positions were: Apple, General Motors, gold, Market Vectors Gold Miners, and Microsoft. The two new positions he invested in during the quarter were Dell and Xerox (Editor Note: I am long MSFT, DELL, and GM). The last 6 weeks of bullishness has been driven by a combination of bettering of sentiment out of Europe, driven largely in my opinion by the ECB's simply enormous LTRO program, as well as improved economic indicators in the United States. 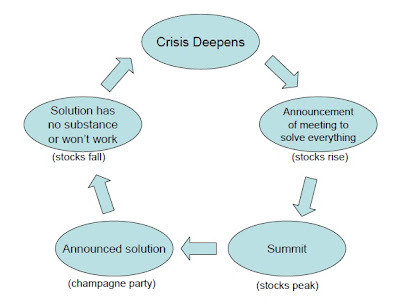 It remains to be seen if Europe can break the cycle laid out above (i.e. we are right now in the 'champagne party'). On the credit side, things feel pretty customary on the new issue front. High yield and bank debt deals are not 3-5x oversubscribed like they are in "go-go" markets. There has been a pretty good amount of supply but these deals are not flying off the shelves. IG books are filling quickly with deals going subject very quickly after launch. To me this is a function of more the lack of supply of paper that came to market in parts of the 4Q. So to me, the appetite for risk is fairly customary and credit markets are not in either of the extremes of extreme bullishness (i.e. you should sell) or extreme bearishness (i.e. you should buy). Fair value to slightly overbought as investors reach down for yield seems a fair characterization on the current credit markets. Here are some of the things we are reading over the long weekend here at Distressed Debt Investing. Enjoy! iGlobal Forum is pleased to announce the 3rd Global Distressed Debt Investing Summit due to take place on February 8th, 2012 in New York City. As the distressed debt market navigates through the evolving changes in the economy, new types of deals and opportunities are opening up for prospective investors. Now more than ever, the expanding distressed debt field is of a great interest on a global stage as Europe’s debt market continues growing and outperforming the US. With the recent European credit crisis strongly affecting worldwide markets, it also provides a new outlook and opportunities in a number of different sectors. The upcoming Summit will provide attendees the chance to explore opportunities in the major sectors such as real estate, structured credit investing, the wavering Maturity Wall, and more. For those looking for more information on the conference, please visit the conference website: Global Distressed Debt Investing Summit. Distressed Debt Investing will be in attendance and we will be sure to bring you coverage of the issues and topics presented. Hope to see you there. In the painfully slow, last week of the 2011, Petroplus ("the Company") announced that its revolving credit lenders froze approximately $1 billion of uncommitted lines under its revolving credit facility. Bonds dropped 10 points from 60 to 50 on the news. News started to trickle out that the company would need to shut down some of its refineries as the lack of liquidity would make it impossible to source crude for its refining operations. The company was downgraded by both S&P and Moody's, with both rating agencies citing near-term liquidity risks at Petroplus. "The Company also announced that access to all of its credit lines under the Revolving Credit Facility has been suspended and access to its pledged bank accounts with its Revolving Credit Facility lenders has been restricted, pending the outcome of the negotiations with the RCF lenders." Bonds dropped another ten points on the news. Press reports indicate that since then, Petroplus has hired four financial advisors (including Rothschild), and bank lenders have also hired counsel and an FA to assist in the ongoing issues at the Company. According to the Company, these refineries have a combined capacity of approximately 667,000 barrels of crude per day. In its announcement stating that all its credit lines have been suspended, the Company noted that two of the five refineries are being shut down, one is expected to run out of crude in the next week, and that the two remaining (Ingolstadt and Coryton) are running at lower than normal capacities. Without liquidity, Petroplus cannot purchase its raw material (crude) to process into refined products. As of the Completion Date, the Senior Guarantors will consist of the Company, PRML, PPI, Petroplus France and Petroplus Bermuda. The Company is the parent company of the Petroplus group and holds, directly or indirectly, the Capital Stock of all of its Restricted Subsidiaries and does not conduct any revenue-generating operations. PPI is a first-tier intermediate holding company. PRML directly owns and operates the Coryton refinery; directly owns the Capital Stock of Petroplus Refining Teesside Limited, which own and operates the Teeside refinery; directly owns the Capital Stock of Petroplus Marketing Limited, which engages in commercial activities with respect to the Coryton and Teesside refineries. Petroplus France directly owns the Capital Stock of (a) Petroplus Raffinage Reichstett SAS, which owns and operates the Reichstett refinery, (b) Petroplus Raffinage Petit-Couronne, which owns and operates the Petit-Couronne refinery and (c) Petroplus Marketing France SAS, which engages in commercial activities for the Reichstett and Petit-Couronne refineries. Petroplus Bermuda is a finance company and does not engage in, or generate any revenues from, refinery operations. "Following the assumption of the obligations under the Notes by Petroplus Finance Limited and the release of the proceeds of the Offering from escrow, the Notes, the New Convertible Bonds and the Existing Senior Notes will be secured (equally and ratably) by the following collateral: (a) intercompany loans made by Petroplus Finance Limited to Petroplus International B.V. and Petroplus Holdings France SAS in an aggregate amount equal to (i) the aggregate principal amount of the New Convertible Bonds ($150 million) and (ii) the aggregate principal amount of the Notes, (b) an intercompany loan made by Petroplus Finance Limited to Petroplus International B.V. in the amount of $1.2 billion, (c) intercompany loans outstanding to Petroplus Marketing AG of no less than $1.0 billion and (d) a pledge of all the shares of the Petroplus Finance Limited." This disclosure brings up all sorts of "double dip" issues that frankly, I have yet to wrap my arms around yet. This is the first of probably many posts on Petroplus that I will share with you as the situation unfolds. Right now my initial inclination is stay on the sidelines despite my belief that an asset like Coryton is a pretty darn good one. To me, the company is going to need a lot of capital to restart its operations (or convert its operations to storage) and purchase crude (i.e. priming risk), the situation in Europe is not conducive to expanding crack spreads (though the closing of the Petroplus refineries will surely help their competitors), and the suspect guarantor structure, among other things. I am still sharpening my pencil on this one and would love to hear if you are working on it. Over the weekend, a reader sent me a question on how I go about finding this to look at in distressed debt land. I may have covered this on the blog tangentially over the past few years, so I thought I would take a stab at it with a summary post. That might sound amazing simple, but really, that is exactly how it happened. I know about 4 or 5 analysts that started looking at the bonds when they dropped in November. I never got a chance to so now I am playing catch up. With that said, when times are more sanguine than they have been in the past few months, I will use that time to sharpen my pencil on names that had little sponsorship or no hard catalyst but was trading at a juicy yield. I've been looking at Ahern for over a year now flying in the dark as they had not released financials for some time (we got our first glimpse from the bankruptcy filing). I've looked at ATPG for nearly a year now. I've looked at Eastman Kodak (and still really don't have much opinion) for three years now. In that, I want to know who the players are in a particular situation. On both the investing side and the financial advisor side. If a group of investors are getting together to provide a DIP for XYZ debtor, and I have a position in the name, I want to be part of that group to protect my original investment. "FAs" take a ton of calls from the buyside trying to better understand the dynamics of a situation. 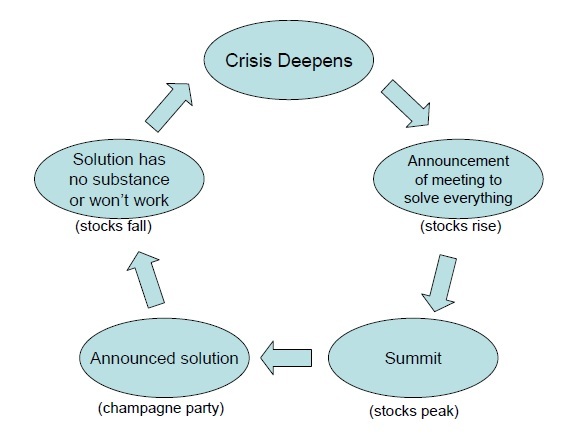 One of the greatest aspects of distressed debt investing is that complexity creates opportunity. Lehman Brother and American Airlines have such rich capital structures, with so many avenues to allocate capital, that an analyst could spend an entire year working on one or the other. Seth Klarman once noted in a speak to Columbia Business School students that Baupost had an "Enron Analyst" - the analyst's sole job was to understand everything Enron and help Baupost make money anywhere in that structure. Because of this dynamic, capital structures themselves present opportunities for me. While this is more than likely in more complex bankruptcies, the fact remains that capital structures are indeed getting more complex with 1st / 2nd lien structure, varying guarantors, etc. I talk to a lot of other investors. One of the reasons for me starting the Distressed Debt Investors Club is so I could have an avenue to write to other investors during the day (I have about 500 posts on the member's message board). This inevitable creates a two-way conversation offline where me and another intelligent investor can compare notes not just on a specific bond or equity, but also shares ideas or what we are spending our time on. In addition, I read my "competitors" SumZero and VIC for ideas on the equity side that I may have missed. I also read notes and presentations from the sell side's distressed desk analysts to see what is topical to investors and what the market is pricing in. I read a ton of bankruptcy filings. Too many probably. It's a guilty pleasure. All those references to 363s, lease rejections, cram-downs...Is it getting hot in here? In all seriousness, I try to keep a calendar of all major bankruptcy proceedings coming up and either listen in via CourtCall or know someone attending the proceeding to see if any news comes out that isn't fully reflected in the price at the time. From a post re-org perspective, I want to know the first day the stock trades (when issued) and want to have an opinion on valuation before that so I can act accordingly. In addition, and some will call me crazy, but I take a cursory glance at every publicly traded bankruptcy filing that has a listed ticker. Many times the equity in these are zero. With that said, one out of every twenty-five in my estimation is a hidden goldmine. Last year, at one point in time, I had 30% of my personal account allocated to the equity of a company in bankruptcy. The downside was diminimus (there was a stalking horse bid already at above the equity trading price) with substantial upside (someone came in well above the stalking horse resulting in a nice gain). For those interested, you can run the function BNKF in Bloomberg for all bankruptcy filings (Note: This is not for the faint of heart). Moving back real quickly to post re-org equities, I have a Bloomberg monitor with every reasonably liquid company that has emerged in the last five years showing me all time lows, 52-week lows, emergence price. If something is really ticking down hard, I'll refresh on the situation (I probably covered it in bankruptcy so shouldn't be that hard to get up to speed) and see if I have a reasonable idea on valuation. Where else are investors finding market inefficiencies created by forced selling? Would love to hear about them in the comments. A few months ago I wrote an introductory post on Maiden Lane and Non-Agency RMBS. Since then, I've wanted to bring on someone to help write posts on the various flavors of structured/securitized finance. If you remember, in November, I reached out to readers to see if people would like to contribute. Luckily, I got a perfect match on the structured finance front. In 2012, we will try to do at least one post a month discussing everything from CMBS to Prime-X to CLO liabilities. As we add new writers throughout the next few months, I will add them to a contributor section in the right side-bar so you can see all of the relevant posts to a topic. With all that said, here is an introductory post on the valuation on private label / non-agency RMBS. We will be doing a few posts explaining some of the introductory materials in the coming weeks. Enjoy! As a subset of the structured products world, non-agency RMBS are essentially claims to cashflows from pools of non-agency guaranteed mortgages. These securities are backed by mortgages that were not qualified to be securitized by the GSEs due to their large balances, lack of full documentation, low credit scores or non-standard terms such as negative amortization schedules. As a result, non-agencies are very sensitive to the credit performance of their underlying collateral. Non-agencies experienced continuous price appreciation throughout 2010 and into March of 2011, driven primarily by supply constraints and relative cheapness of the sector. Since then excess supply from Maiden Lane II and European Banks, rally of the forward curve and heightened macro-economic volatility have brought the sector down 30% from their March peak. Nomura Securities has recently published that the spread between the ABX 06-2 AAA and CDX HY 5yr is trading at 1 year wides – the relative value is further highlighted by the fact that spreads in the ABX are loss adjusted. In light of the opportunities provided by this sector, I have provided an overview of the valuation process of non-agency bonds below. This information is readily available on both Intex and Bloomberg. The classification is useful as different collateral types/seniorities will result in drastically different cashflow projections and discount rates. 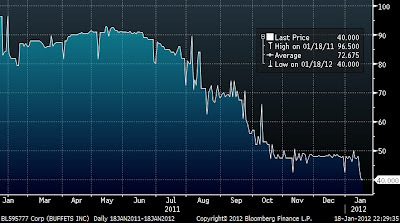 Historic 1-month, 3-month, 6-month, and 1-year cpr/cdr/sev data for a deal can be found on Bloomberg by typing “SEV”. This can also be found on Intex by expanding the history in the collateral section. In absence of special situations that can cause drastic spikes in immediate prepay, default or severities (ie. servicer takeover or resolution of servicing lawsuits), the most recent 1-month or 3-month numbers can be used to proxy for the deals’ near term cpr/cdr/sev’s. Longer term prepayments will generally experience burnout and trend downwards as borrowers with the means to prepay will have already done so during 2010-2011, when refi rates hit historic lows. Collateral multiplier: Look through Bloomberg, Intex or LP’s collateral stratifications and identifying the % size of the 1 year current and 60+ (inclusive of BK, Foreclosure and REO) buckets. One can then run various default vectors on intex until they reach remaining liquidations to around 1.5-2x size of 60+ delinquency bucket and/or 100 minus 1-1.25x size of the 1-year current bucket. PD by Collateral Bucket: Assign a probability of default to every permutation of CLTV, FICO, and Loan Balance bucket within the remaining collateral and take a sumproduct of the probability with the relative size of each bucket to arrive at the remaining liquidations number. Given a large portion of cashflows for distressed non-agency sectors come from liquidation proceeds, projecting severities is perhaps the most important part of RMBS investing/trading. Base adjustments to cohort level severities are made based on loan size, where smaller loans generally receive lower recoveries, geographic distribution of loans, where higher concentrations of loans in judicial states imply longer liquidation timelines and higher severities, general timeline for liquidations of delinquent loans and HPA adjusted for LTV. In general, dealers are expecting a slight increase in medium term severities due to 2011’s extended liquidation timeline. Long term severity will likely decrease below current levels due to generally better collateral composition (LTV of current collateral is low from a historical perspective), increased concentrations of modified loans (modified loans exhibit 7-8% lower severities) and will also incorporate the investor’s view on hpa (higher hpa implies lower severity). Additional considerations: For subprime front pay bonds, investors pay very close attention to servicing trends. Recent consolidation of the servicing industry (acquisition of Litton, HomeEq and Saxon by Ocwen) has resulted in significant servicer recaptures and disruptions to cashflows to front pay subprime bonds (Ocwen is known to be one of the most aggressive servicers in terms of recaps). One can sanity check payments streams for these bonds by looking at projected interest versus actual interest received in recent periods. Finally, one must discount the obtained cashflows with an appropriate risk adjusted yield/oas to arrive at an intrinsic price (yields are most commonly used). These yields generally vary with macroeconomic fluctuations, housing price uncertainty and housing policy developments. Given the uncertainty of the collaterals’ cashflows, investors/dealers will generally run yields of non-agencies at different cashflow scenarios (stress/optimistic) and arrive at a narrow range of potential prices. As you can see, throughout the first half of the year it was a steady grind for investors with spreads hitting a low in the beginning of April fueled by sanguine default outlooks, healthy inflows, and robust appetite of new issues. We all know what happened next (debt ceiling, increased fears over Europe and double dip, etc). Credit Suisse's "Distressed Securities" category which captures CC, C, and default securities was down 5.46% for the year which is in the range of where I am hearing distressed debt funds performed during the year. And remember, this is just bonds. We saw many 2nd lien loans drop precipitously during the year (Quiznos for instance). According to JPM, the par-weighted default rate for bonds and loan during 2011 was 1.8% and 0.4% respectively, in line with forecasts of a muted default rate for the year. This coming year analysts across the street are generally predicting a higher default rate for high yield credit relative to 2011. Depending on who you talk to, estimates range from the low of 1.5% (JP Morgan) to a high of 4.8% (Goldman Sachs). On the whole though, it seems that default assumptions for 2012 are higher now than they were a year ago reflecting credit strategists increased pessimistic view on the investment environment.